Empire Outlets New York City, also known as Harbor Commons, is New York City’s first outlet shopping centre. In the wider New York area there already was Woodbury Common Premium Outlets, but a more central designer outlet had been missing. 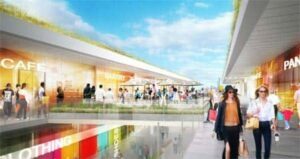 In May 2019 the Empire Outlets will open their doors. Behind the doors of Empire Outlets you will find a 107,000 m² retail complex, that features 100 shops full of food and entertainment, but mostly: fashion. Generally, New York people love their fashion. And now, finally, they can satisfy their cravings in this paradise full of affordable items by designer brands. And so can you! Do you fear one day of shopping won’t be enough? The solution is close-by: the complex will also include a 200-room hotel. New York City’s first own designer outlet area is located on Staten Island, in the St. George Waterfront District. Harbor Commons will be easily accessible. It will take you a (free!) 20-minute Staten Island Ferry ride to get from downtown Manhattan to the Empire Outlets. Getting there is an experience in itself, passing by the Statue of Liberty, Ellis Island and the Lower Manhattan skyline. But the Staten Island Ferry isn’t the only way to go. Due to the extra amount of people that are expected to visit St. George, there’s a variety of new, direct travel options popping up.